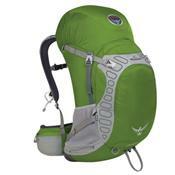 Stay cool and dry on long summer hikes when you wear the Osprey Stratos 36 Backpack on your back. The Airspeed suspension and spacer mesh hip-belt and shoulder straps make hot morning inclines a delight. When the muggy heat whips up an afternoon thunderstorm, you can pull out rain gear from the medium's 36L of space.